My hair care routine has changed a little over the past few weeks as I colored my hair for the first time ever with highlights! Some of the hair care items I had been testing and wanted to review had to be re-tested with colored hair as I’ve found it a bit drier in texture and in need of more moisture. The good news is most of my styling staples fortunately have still worked for me! What has changed though is the need for different shampoo, conditioner and more hair masks. All of these worked for my normal thick hair, now that it’s colored I feel the Sisley and Moroccanoil work best to add shine. A couple that don’t work quite the same for me include the Shu Uemura Essence Absolue and the Living Proof No Frizz Nourishing Oil. They still add softness but now my hair just soaks it up and no shine is added. Brush I currently use is the T3 Dry Vent Brush. I like it enough to keep using it, but I’m still in search for my holy grail. The Gisou Honey-Infused Hair Oil is one of the best smelling oils I’ve tried. It smells of honey, almond and a hint of coconut. It’s infused with honey from Negin Mirsalehi’s family bee garden. I was sent the Travel Size Oil (50 ml, exclusive to her website) and love it for it’s lightweight finish and soft shine. No greasy look or residue and it makes hair very soft. She just launched the Hair Perfume (100 ml) which has a more floral perfume like scent to it. It has a more powdery scent compared to the oil, I think it’s beautiful but prefer the oil if I had to pick one. I have ordered from her website before (they ship to the US), but you can also find her products at Urban Outfitters and Revolve. The Rahua Legendary Amazon Oil is something I was really interested in trying out. It’s a plant-based silicone-free hair oil. It’s described as lightweight but I found it to be on the rich side and would recommend it for dry or damaged hair, and particularly if you have thicker strands. A little goes a very long way to coat the hair, I prefer using it on damp hair with just one pump. On my virgin hair pre-coloring it added incredible softness with a soft sheen. On my color-treated hair it adds softness but I find it challenging to find the right amount to use. Too little doesn’t add enough shine and one coat too much results in something that looks too heavy for my hair type. The oil has a very natural smell to it which fades after a few minutes. Based on the texture I tried I do think it would be too thick and heavy for fine hair, but if you’re looking for a silicone-free option this is a nice one to consider for very dry or coarse hair. Shu Uemura Art of Hair Satin Design is something I discovered and reviewed years ago. It’s a blow dry lotion used to heat protect hair, remove frizz and add softness. I used up a bottle and repurchased but it sat in storage most of last year when we moved around a lot. I rediscovered it recently and my color treated hair LOVES this. It has the right texture, emollient and finish to make my hair soft and remove any signs of dryness. After using and blow drying my hair it is incredibly soft, tangle-free and without any greasy residue. Ends still need a little bit of finishing with a shine product or oil, but overall this is a solid win. It gives hair a soft satiny glow. I love IGK for the packaging. Their products are also great too. I hauled two products from Sephora earlier this year. The Thirsty Girl Coconut Milk Leave-In Conditioner got me because of the name coconut. It’s a milk-infused leave-in conditioner that has a spray. The packaging and spray dispenser are excellent – these days I am always amazed when brands don’t package their products with well designed spritzers. I really appreciate that IGK packaging is all on point, not just in the fun design but function as well. As the product name implies it’s a leave-in conditioner. I found that it was very easy to overdo the first few uses. The spritzer is so even and dispenses a fine mist I wasn’t sure I applied enough. It does work like a traditional leave-in conditioner, I think I like it mainly for the scent and novelty of packaging. Performance is good and I have no regrets buying. I’m not sure I would repurchase. If you found it too rich or oily, I think simply sprayed too much on, although I can see how it could be too rich for fine hair. The IGK Good Behavior Spirulina Protein Smoothing Spray also suckered me in with the name “smoothing.” I think their packaging and naming is genius. It gets me every time! This is a heat-protective blow out spray that is supposed to have similar effects of keratin treatments. I have not tried one so I cannot compare, but based on photos I’ve seen after the treatments I do think the IGK Good Behavior spray gives very similar looking results but in the shorter-term (as in it will last a day until you re-wash your hair). As a pre-heat treatment I see similar results with other types of products. I do like that the Good Behavior spray smooths hair, reduces frizz and does make my hair look smooth and fresh all day. As with the Thirsty Girl, I do think Good Behavior is easy to over apply. The IGK applicator spritzers are so good compared to other brands. They spray product very efficiently so you might be used to spraying more product. I’d recommend coating hair lightly and add one spritz at a time as you blow dry in sections if you feel you need more. It gets a thumbs up for me but I do think you can get similar frizz-free soft shine results with other products. This Briogeo Hair-O-Scopes Brightest Stars Bestsellers Kit came at the perfect time for me. It has a full-size Don’t Despair, Repair! Deep Conditioning Mask which is now my holy grail hair mask. I had to wait 72 hours to wash my hair after color treatment. The first two days I found my hair just wasn’t the same, it needed a lot more moisture. This mask rescued it and I never want to be without it now. Prior to my highlights I had been experiencing a lot of breakage in the hair. I do think using this mask (along with the Aquis hair towels) has reduced breakage drastically. I’m still sampling the other items in the kit but the hair mask makes it 100% worth trying. I’ve already ordered another mask. Last but not least are the Aquis Hair Towels. I’ve now tried multiple sizes and products in the line. I really liked the Prime Starter Kit before I had my hair colored to strengthen and reduce breakage. Post hair highlights, the leave-in conditioner just doesn’t really perform the same. It works to smooth and detangle, but I’m not seeing a lot of added moisture or shine. I’m going to put the entire kit to more testing before I give a comprehensive review. For the hair towels I don’t think you can go wrong with any of them. With new hair coloring towels are prone to staining, but the dye washed out and didn’t leave any marks on the white ones. I just made sure I threw them in the washer right away. I thought I’d always be a towel kind of person but their Rapid Dry Turban has a really clever design with a loop on one end and closure on the other. It’s super easy to use and holds hair in place better than wrapping a towel. For the towels, I prefer the longer lengths for my hair. The first one I tried was the Lisse Luxe Long Hair Towel. I then ordered the regular sizes to try and found the longer ones easier to wrap around the head. Andrew has liked and borrowed all of mine and prefers the Waffle Luxe version. I think both textures work the same for me. I’ve bought mine from Sephora, but I just noticed this Ouai Ouai x Aquis Set available at Bloomingdale’s at a really good price. With the holiday sets out definitely look around online for different options. After using the same stylist for nearly 10 years in San Diego, making a change was scary when I moved, but one of the best things about South Florida is that the people here are so nice. I found a salon on Yelp and decided to try based on the reviews. They made me feel completely at ease as a new client, I loved them and went back. I decided to have my hair colored for the first time there and loved the results. I was so nervous that I nearly cancelled but my husband and mother in-law came with me and assured me it would all be ok. The day of appointment the salon asked if they could film the process for their social media feed and I said sure. They put together a fun clip if you want to check them out I linked it below. Quick FYI this is all still my natural hair except for the coloring, no extensions. Just highlights – they also curled my hair for fun afterwards. I was truly blown away by everyone’s kind words about the new hair. You made me feel so loved with the sweet comments and suggestions about hair care, shampoos and everything else in between. I’ve been testing different shampoos and conditioners which I’ll be reviewing soon, for now I wanted round up the oils and other products I have been testing for hydration and smoothness. Overall, my favorites are still my favorites. I do love the Gisou Hair Oil for the soft finish, shine and scent. The Aquis Hair towels and Briogeo hair mask are life savers for me. I’m thrilled that I rediscovered the Shu Uemura Art of Hair Satin Design and am amazed it didn’t go bad (it was in storage for months, granted it was an climate controlled one). What are your favorite hair products for hydration, added shine and smoothing? Let me know what hair type you have in the comments too! Press samples featured include the Sisley Hair Oil, Aquis Hair Turban, Moroccanoil Hair Treatment, Briogeo Hair-O-Scopes Set, Rahua Oil. Happy Weekend! Taking a quick break from reviewing new makeup launches to highlight some other things I’ve had in rotation that I’ve been loving. This is a mini peek at some things I’ll be expanding on soon. Working on more hair care stories, fall fragrance and skin care roundups by popular request so stay tuned! So many of you have been asking for a review on the Simplehuman Sensor Mirror Compact. I’ve featured it on Instagram a few times and have found it to be quite handy. It comes in several different color options and I bought it in two colors Rose Gold and Silver (you definitely don’t need more than 1 color, I bought one to keep at my desk, another for on-the-go/travel). It has 3x magnification and it’s extremely sharp and clear. It has Simplehuman’s lighting that they call “tru-lux” which mimics natural sunlight. I like that it’s really sturdy, comes with a pouch you can store it in, has two light brightness settings and also comes with a fold-out ring you can hold in your hand or use to stand up on a flat surface. It’s rechargeable and the lights last a long time without me having to recharge frequently, although I find the mirror is so good I don’t always use the lights. It’s indeed quite a splurge for a compact mirror, but the quality is very good, it’s well made and designed. I really like the pouch because it’s compact and not bulky. The product itself measures a little over approximately 4 inches in diameter, mirror is 4 inches wide. Available at Nordstrom, Neiman Marcus, Dillard’s. Chanel La Creme Main Texture Riche has been in heavy rotation! I really love the texture and way it smells. I know we all have our favorites but I’m really loving the packaging and velvety finish. Full review in this post with ingredients. All three available at Chanel.com. The Bite Beauty Agave Lip Mask is something I’ve used up several times. I think many of you will agree it’s one of the best most hydrating lip products. For some reason I didn’t think any of these had a fun scent/taste. I just realized that Maple and Lavender both have a sweet candy like taste which is really pleasant. These pretty much go on clear even the tinted ones. Maple is my lips but better and actually does give my pigmented lips a tint. Smashed is a very sheer red. There’s a new one that looks like it’s an online exclusive called Candy Apple. Also available in a cute Agave Treat Trio Mini Set with Natural, Candy Cane and Maple. Available at Sephora and Bite Beauty. So many things I’ve been wanting to write about for skincare. I’m trying to organize my roundups by category in an updated series for you. If you have any requests or questions let me know in the comments! For now a few things I think are amazing are from Sisley, Drunk Elephant and Fresh. The Sisley Black Rose Face Mask is one of the best hydrating masks I’ve ever tried. It’s a cult classic and lives up to the hype. A tube is quite the splurge and I’ve hoarded every mini and sample I’ve gotten for ages. The Sisley team sent a tube and I was beyond grateful for it! It’s really truly amazing. It will be forever in my routine. It softens and plumps the skin making it feel super soft and radiant. There are a few sets available with this in the full size and minis so if you’re in the market to splurge I highly recommend looking online first. They give price breaks for the sets and often have good gift with purchases. Available at multiple retailers including Sisley-Paris. I’ve received so many questions about Drunk Elephant lately! It’s a line I’ve really wanted to try more but haven’t had a chance to yet. Skincare testing takes so much time. I’ve only tried two things so far, but have had great success with both. The TLC Sukari Babyfacial is one of the few AHA/BHA resurfacing products I’ve tried I think works, but over multiple uses. This is an area I want to experiment more with. I’ve had more time to experiment with this and find that the tingle truly depends on what other items you’ve been using in your routine. Any acids or retinols or even scrubs you use increases skin sensitivity. Both Andrew and I have been really interested in learning more about acids and peels. Until we get a strong one done at a dermatologist or clinic, we’ve been testing a few at home. I think this one is strong enough to give visible results. Skin is left baby smooth after a single use. For me I didn’t really see texture improve until a few uses, but that is expected. The other Drunk Elephant item I’ve tried which I love is the Protini Polypeptide Cream which I still recommend and love. Both available at Sephora. Then there’s the Fresh Beauty Sugar Face Polish which I’ve featured a number of times already but had to mention again. It’s a sugar scrub that melts into the skin so it’s not harsh. It smells amazing, leaves the skin soft and exfoliates without being too gritty. Everything in the Fresh Beauty line is on the pricey side but the products leave me feeling like a new person. For the holiday I always get questions about what to get the person who has everything. I’m compiling a gift guide series, but for sure you cannot go wrong with Fresh. Even if they already own the products, it’s such a beautiful line – their masks are amazing and are bound to be loved and used up. I think their Mask Sets are the best things you can buy for yourself or a friend. Last year the four piece mini set sold out super fast. This year’s there are a few options. The Great Escape Face Mask Set is available at Nordstrom. There is also a slightly different variation called Mask for Miles exclusive to Sephora (minis shown above are from the Sephora set). A fall fragrance edit coming your way soon but right now it’s still in the high 90’s. No signs of feeling like fall here in Florida but scent helps put me in the mood. Three I’ve been reaching for frequently include Jo Malone Wood Sage and Sea Salt (but I like this year round, notes include bergamot, ambrette seeds, buchu leaves, sea salt, mineral accord, dry fruits, driftwood accord, guaiac wood, white musk, sage). I bought mine from Nordstrom. Also available in a mini in the 5-piece Cologne Collection set. Byredo Bal D’Afrique has a warmer feel for me and I love it during this time of year (notes include bergamot, lemon, neroli, African marigold, bucchu, violet, jasmine petals, cyclamen, black amber, musk, vetiver, Moroccan cedarwood). I bought mine at Nordstrom. You can also find it in the travel spray size in the La Selection Nomade trio. All three Chanel Les Eaux de Chanel-Paris perfumes are perfect. Les Eaux de Chanel Biarritz is the best for citrus lovers but it has a lighter feel more like spring or summer. For fall I think Les Eaux de Chanel Venise is perfect with neroli, oriental accord, amber, a bit of vanilla and tonka bean. Based on the notes you can sense the feel that I love bergamot and citrus notes. Available at Chanel.com. I get asked about the Gisou Hair Comb frequently. It’s such a beautiful basic wide tooth comb although it’s not available at a lot of places. I ordered it directly from the Gisou website and really like it. It comes in the prettiest pink pouch which I don’t use but when I travel I’ll keep it inside. 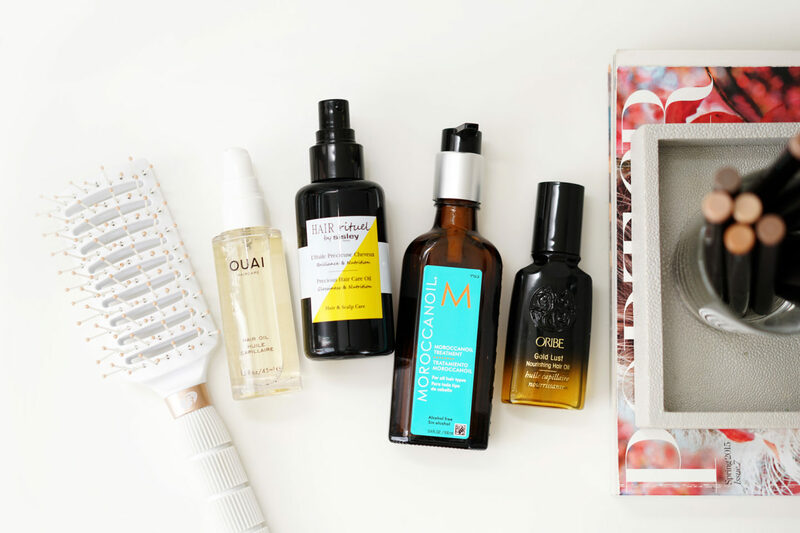 For hair oils I have more that I’ve been testing coming your way soon, but two I love include the Sisley Hair Rituel Precious Hair Care Oil (reviewed here and here) and the Ouai Hair Oil (reviewed here). Both are great for shiny smooth hair. There are so many great makeup basics that I have in rotation. 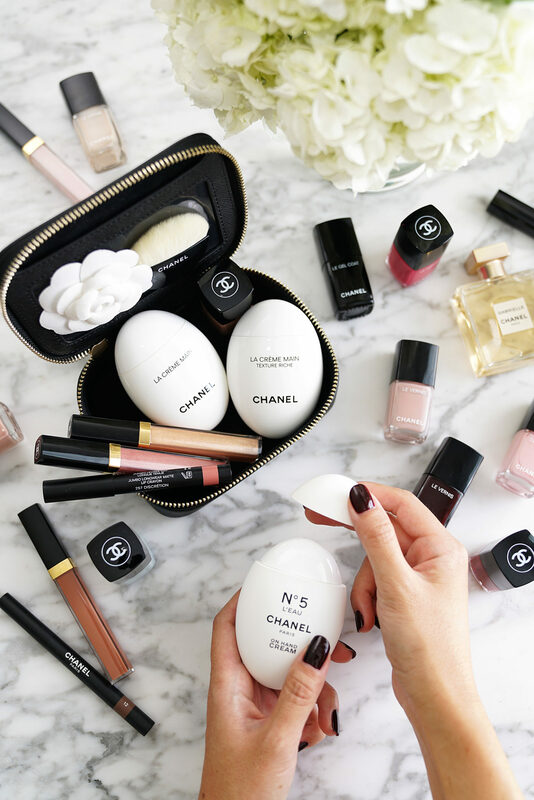 With all the new beauty that launches weekly I sometimes forget to mention everyday basics. The Armani Luminous Silk Foundation was one I used years ago and the formula never lasted on me. I decided to give it another try based on the overwhelming number of requests I’ve had to review it again. I’m 6.5 and 7 mixed. I’ve found if I combine it with the Laura Mercier Oil-Free Primer it lasts all day on me (I do need a touch up mid-day though). I think what moisturizer and primer you use with this is key. Otherwise as with many foundation formulas using a base that isn’t compatible will make the product either separate or pill on your skin. I mix the shades because 6.5 is a little too yellow and 7 is a little neutral. I bought both of mine from Nordstrom. Chanel Matte Les 4 Ombres in Clair Obscur is my go-to matte quad these days. It’s easy to use and I don’t have to think about what else to combine for eyes, cheeks or clothes. It’s versatile and goes with everything I wear. Review + swatches here. Available at Chanel.com. That wraps up my loving right now roundup! As always I’d love to hear what you are loving right now. I’m starting up weekly giveaways again now through end of November. There are two places I’m doing giveaways, one is on Instagram (announced weekly on stories so make sure you follow for details there). Another one is going to be via the blog. This week I’m giving away a full-size bottle of the Sisley Hair Rituel Precious Oil + Ouai Hair Oil to one reader. Open internationally but you must be 18 years or older to win. To qualify you must follow ALL the steps in the widget below, partial entries will be disqualified. Giveaway runs through 10/22 11:59 PM EST. I’ll pick a winner within 48 hours after giveaway ends and contact via email. Press samples featured include: Sisley Hair Rituel, Sisley Black Rose, Chanel Venise. All others purchased by me. I have a roundup of my Sephora haul picks from the Beauty Insider Appreciation Event for Rouge. I ended up purchasing a little bit from every category for makeup, skincare and hair care. I still have a few things sitting in my online cart but since I did a massive haul I will probably not be purchasing anymore items for the event. I just hauled everything on Friday so I haven’t had time to test everything. Notes and first impressions on the items I have been able to test. beautyblender Bounce Liquid Whip Long Wear Foundation in 3.50 and 3.60, they only had a tester of 3.50 and while it looked good in store it did apply a little on the light side. I bought 3.60 and tried it at home which is a perfect match. I am getting tan though with regular outdoor runs. The next shades up look like a big jump so I may have to mix when I get darker. First impressions are really good, I like the coverage, it lasts all day, it’s not irritating and didn’t oxidize too much. A more detailed review to follow. It Cosmetics Your Skin But Better CC Cream Oil-Free Matte in Medium Tan – I’ve yet to try any of the It Cosmetics bases even though they’re extremely popular! Medium looked too light in store but after swatching Medium Tan at home I think it may be too dark. I will report back after I give it a test. Natasha Denona Transformatte Pore Vanishing Matte Foundation samples in 27WY, 30W and 31W. These oxidized like crazy in store on my hand, but when I tried this on the face at home they did not. I still need to do more testing, but this is a full coverage true matte. I think my best match is 31W which is more yellow/olive. Fenty Beauty Pro Filt’r Instant Retouch Primer (mini, beauty insider perk) – excited to try this! Swatches below. Also included MAC Studio Fix Fluid in NC30 and NC35 for reference. Also not a haul item but since some of you have asked, I wanted to share some swatches of the new First Aid Beauty Concealer. It’s available in 7 shades. I received press samples of this formula but haven’t had a chance to test this out. I will keep you posted. I think my shade match is going to be #3. Glow Recipe Watermelon Glow Jelly Sheet (x2), these sell at $8 per sheet, I love the moisturizer and night mask so I’m excited for this! Peter Thomas Roth Water Drench Hyaluronic Cloud Cream and Hydra-Gel Eye Patches, will keep you posted! The online reviews make these both look very promising. I already reviewed and swatched the five Hourglass Scattered Light Eyeshadows a few days ago. I wore Smoke yesterday and loved it! In addition I bought the Anastasia Beverly Hills Soft Glam Eyeshadow Palette and Fenty Beauty Pro Filt’r Amplifying Eye Primer. I didn’t have time to swatch or test the palette or primer but I did give them a quick look in store and the shadows are super soft and pigmented! I’m always a sucker for a good lip. I actually bought the Fenty Beauty Mattemoiselle Plush Matte Lipsticks before but they were lost in all our moving last year. I repurchased S1ngle and Spanked, both are ultra smooth with full coverage and aren’t dry looking. I need to try more of these! I also picked up two of the Bite Beauty French Press Lip Glosses in Salted Caramel and Dirty Chai. Both are perfect neutrals. I tried Salted Caramel and think it’s the perfect pink beige. I also bought one of the new Anastasia Beverly Hills Lip Glosses in Estrella which is so sparkly I don’t recommend it. It’s not chunky, it’s very smooth but the shimmer is a little too much (it was an impulse buy). Last but not least the sparkles got the best of me and I picked up the Pat McGrath Lip Fetish in Gold Astral to try. That wraps up my Sephora haul! If there are any items you want reviewed first let me know in the comments and I’ll try to prioritize those! First Aid Beauty concealers provided for review. Other items purchased by me. I finally splurged on the Dyson Supersonic Hair Dryer because Sephora has a Dyson x Blown-A-Ouai Set this season. It’s one of the most expensive beauty tools I’ve purchased and based on my testing I think it 100% lives up to the hype. After reviewing the new Harry Josh Ultra Light Pro Dryer I was thrilled to see how many of you love haircare posts and especially surprised many expressed interest in a review of the Dyson Supersonic. This dryer has been out on the market for quite some time now and it has caught my eye on numerous occasions but I could not bring myself to splurge as I already own and love several other dryers. The Sephora set pushed me over the edge and for those who have been contemplating it for the Beauty Insider Sale I hope this review helps you make your decision either way. This dryer comes with an ultra-hefty price tag but it 100% exceeded my expectations and to me I think it lives up to the hype. The Dyson Supersonic Hair Dryer currently runs at $399 which includes the dryer, smoothing nozzle, styling concentrator, diffuser, non-slip mat and storage hanger. There are a few value sets available at various retailers that come with a case or other accessories. The Sephora Blown-A-Ouai Set caught my eye because it comes with all the nozzles, diffuser, mat and hanger but also has a travel bag and four Ouai haircare products including the Repair Shampoo (2 fl oz), Repair Conditioner (2 fl oz), Soft Mousse (1.7 oz) and the Hair Oil (1.5 fl oz). Because of the mousse do note this must ship ground so it may take a little longer to get to you if you order it. Also it appears that this is an online exclusive at Sephora. Note the one I’ve reviewed is limited-edition for 2017. Current 2018 version Dyson Blown Ouai Set comes with the matte black dryer and slight variation of products. I didn’t take pictures of the boxes but the entire set comes beautifully boxed in three separate boxes. The dryer + attachments come in its own box. The bag has it’s own box. The Ouai products also come in their own box. Everything is packaged in a way that even in transit nothing moves around and all pieces are held securely in place. It may seem excessive but I really appreciate when items are carefully packed (especially liquids) and to me this is super important especially at the price. I must admit I thought there was a chance this dryer was going to be a high-tech gimmick but we’ve owned a few Dyson products for the home and found them 100% worth the splurge. We also own a Dyson Cord-Free Vacuum that we bought four years ago and it’s held up remarkably well even with daily use. We find it essential as we own 3 pets with white fur and they shed constantly. We are always vacuuming, using swiffers and washing the pets. When Andrew first saw this dryer out of the box he did not think it was going to be anything special. Then I turned it on and we did a side by side performance comparison to the Harry Josh Ultra Light and T3 PROi and we both saw that the Dyson Supersonic has a lot more power, more control options, and although it is odd-shaped for a dryer, very ergonomic and easy to hold and maneuver. The air flow is a lot more controlled and for some reason the way it’s designed makes for a less frizzy blow out. I’ve experienced a lot of hair breakage from hair ties over the past few months and as parts of my hair have grown out I find my hair is prone to a lot of static or flyaways that stick up. This of course can be fixed with a bit of pomade, gel or shine product. The Dyson dryer seemed to reduce all frizz for me. This is one of the fanciest products I beauty tools own. It has what Dyson calls Intelligent Heat Control technology because it measures temperature 20 times a second and transmits data to the microprocessor. This in turn controls temperature to prevent heat damage. Power-wise- it has a Dyson Digital Motor V9 which is supposedly on average 6 times faster and a third of the weight of other dryer motors. The motor is actually in the handle which is why it feels different in your hands compared to a traditional one. It is so powerful it nearly knocked off all the things on my counter as I didn’t pay attention where I was pointing it when I turned it on. Due to the high power it does indeed give me a super fast blow out. I like the lightest or medium heat setting for my hair type. It isn’t the quietest I own or the lightest but it’s easy to hold and use. The only con I see is the extra long cord. This could be seen as a pro or con depending on your preference and needs. I find it long and cumbersome and it takes up a lot of space. The bag it comes with doesn’t quite fold over at the top like the stock photo shows but it’s not a deal breaker. It holds the dryer, it’s super long cord + two nozzles which is perfect for travel. The cord takes up most of the space. I don’t usually use a diffuser so I did not test it out, but both nozzles provide precise control. 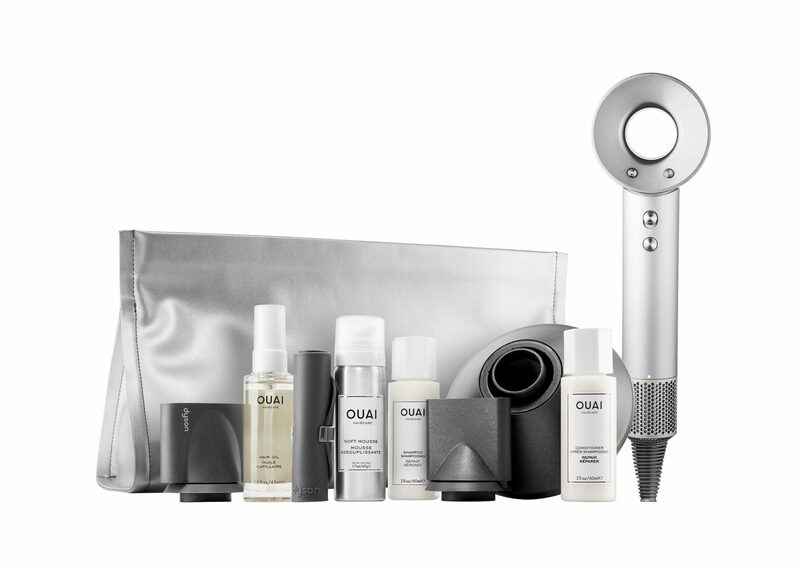 For the Ouai products that come in this set I have already tried and fell in love with the Repair Shampoo and Repair Conditioner. I have been meaning to restock on the full sizes but just bought the Verb Ghost Shampoo and Conditioner which I also really like. The Hair Oil is something I wasn’t a fan of originally because of the scent but it has grown on me over the past year. I gifted several partially used bottles away to friends who were dying to try it but didn’t want to buy the full size without trying it first. I’m glad I have another one now. The Soft Mousse is new to me. I’m not a mousse fan simply because I don’t like the texture and find them sticky. This one is exceptionally soft like the name implies and has a very nice dry down. A quick hair demo. Since I just got this I haven’t been able to put weeks of testing into this. I have tried it 8 times so far and used this multiple times in a single day. My hair has held up just fine to the heat and power. I do find the highest heat setting too strong for me right now (just for scalp sensitivity) but it did not scorch or dry out my hair. Do note the components will get hot so after you dry your hair I recommend you don’t touch it. I used the Ouai Hair Oil to prep my towel dried hair. Hair was dried very quickly within 5-6 minutes. The result was perfect evenly dried hair with a lightweight feel and airy feel without any signs of frizz. My ends needed a bit of work but I haven’t had a haircut in months. Because I know you all love the comparisons here is a side by side look at the Harry Josh Ultra Light and T3 PROi. I really cannot pick a favorite. All three perform exceptionally well. The Harry Josh and T3 are both lighter in weight than the Dyson. The Harry Josh is the most gentle on the hair – if you have sensitivity to heat, this one has the softest (but still powerful) heat settings so you don’t get that crispy feeling on the scalp after drying your hair. The T3 gives me shinier hair after a blow out but doesn’t cut down the dry time. The Dyson is by far the most powerful. When you look at the Dyson it doesn’t look like it would be travel friendly but when I compare it to the other two, based on the shape and design I think it is. If I were forced to pick one to keep right now I’d say I would keep the Dyson. Harry Josh comes in very close second. Why? Simply because the Dyson packs in more power and the fact that it leaves my hair with zero frizz is really impressive. That being said I did read some of the negative reviews online and if you have very dry hair or a sensitive scalp, I’d recommend opting for the Harry Josh instead. While the Dyson did not dry out my hair I think the sheer strength and power could be too much for some. Bottom line a winner for me. I wholeheartedly recommend it and for me it 100% lived up to the hype. Definitely worth the splurge for me and I still can’t believe I spent $400 on this (I ordered it before the sale started). While I love it, I don’t think you need to spend this much to get a good quality dryer. There are definitely other more affordable tools that will get the job done well. You can find the Dyson Blown-A-Ouai Set exclusively at Sephora for $399. One shown is 2017 version. New version here. There are a few other sets available right now and as the holiday season approaches I suspect more could pop up. You can find the Iron/Fuchsia win a special limited-edition Dyson Your Blowout Set at Nordstrom for $399. There is the Iron/Fuchsia with a Light Pink Case at QVC for $399. Also three variations of the Supersonic + Living Proof at QVC for $399 as well. Have you tried the Dyson Supersonic before? What did you think? I have an updated hair care routine for summer to share today. Since moving to Florida I’ve been struggling for months to find a good shampoo + conditioner combo. The water here is so different from California and even with a filter in the home, many shampoos and conditioners simply don’t rinse or lather the same. I’ve tried a lot of my tried and true favorites alongside probably at least 15 other formulas and it’s been a real challenge to find something that works. Also with the heat, humidity, chlorine and salt my hair behaves differently. It gets dried out easily but the humidity also means sweat and oils surface so it feels like everything is just a hot mess. For a quick recap on my hair – I have long thick frizz-prone hair. It’s never been colored or highlighted (at least not yet). Many of the styling product favorites remain the same. My current favorites right now listed below. Molton Brown Inspiring Basil and Vetiver Shampoo and Conditioner ($30 each for 10 fl oz) is part of a limited-edition collection Molton Brown created for the Seabourn cruise line. This is my current holy grail duo. I’ve tried at least a dozen other brands and formulas over the past months and nothing compares to this duo for a good wash. It cleanses and leaves the hair feeling super soft and naturally shiny. It has a very soothing soft natural scent. I’m a bit upset it’s limited-edition as I’d love to keep repurchasing this for like FOREVER. I’m stocking up so I’ll be able to have this for a while. The entire Molton Brown x Seabourn Collection is amazing. I highly recommend you check it out. Christophe Robin Cleansing Volumizing Paste with Pure Rassoul Clay and Rose Extracts ($53 for 250 ml) is seriously an amazing volumizing past. You apply it to dry hair and scalp, add water and it foams up into a volumizing paste that feels airy and thick at the same time. It leaves the hair bouncy and full without any added weight. Oribe Cleansing Creme for Moisture Control ($46 for 8.5 oz) isn’t shown because I’ve run out twice since moving to Florida. It was a favorite in California and is still a favorite here in Florida. I use this about 2 to 4x a week switching it out for regular shampoo/conditioner. It’s perfect to restore dry hair to a more natural balanced state. Oribe Gold Lust Dry Shampoo ($22 to $44) is something I keep in purse occasionally in the smaller size as a refresher. I wash my hair everyday, sometimes twice a day – it’s something I’ve always done and with the summer humidity I think it’s an absolute must. I tend to use dry shampoo as a refresher to absorb oil if I’ve been out for a while and don’t have time to go home to wash it (ie mid-day). There’s really nothing that will fix extreme humidity or wet hair from being rained on, but I find this is a pretty good fix to refresh hair. Back in San Diego there were occasions I did skip a day of washing here and there. This is my go-to for a dry shampoo. It doesn’t have a white cast and as someone with dark hair I really hate any that make my hair look dusty, ashy or grey. MarulaOil Rare Oil Style Extending Primer ($30 for 130 ml) this is a primer spray that’s designed to extend the life of your hair styling. It smooths and primes the hair for heat styling. On me it works to detangle wet hair. I like the way it smells and it keeps hair looking smooth and frizz free all day even with humidity. Christophe Robin Hydrating Leave-In Mist with Aloe Vera ($39 for 150 ml) is a light detangling spray with the most amazing natural soothing scent. It really does work well as a detangler. I have a slight preference for this over the MarulaOil one although they have a similar effect. Shu Uemura Art of Hair Blow Dry Beautifier Thermo BB Serum ($39 for 150 ml) is another favorite right now. I reviewed this back in June alongside the BB Cream. Both are really good lightweight primers for heat styling or air drying. They help keep shape but in a natural looking way. If you’re familiar with Shu Uemura Art of Hair these both have a similar effect to the Satin Design Polishing Milk but have a lighter finish/feel. If you’re more of a spray person I’d recommend the Wonder Worker. You really can’t go wrong with any of them – they’ve all performed extremely well for me as multi-tasking preheat or post styling treatments. Right now I like the BB Serum the best. Moroccanoil Treatment Light ($15 to $44 depending on size) is one of those versatile multi-taskers that great for anything. I can use this as a a styling or finishing product. I love both the regular and light version but for summer I’ve been loving this light one to add a natural shine. I can add it to clean towel-dried hair and just let it air dry. For heat treatment it helps protect the ends and keeps it looking nice and shiny. Verb Ghost Oil ($14 for 2 oz) is another great lightweight oil. It smells fresh and light and won’t weigh down the hair. It comes with a pump (huge plus for me) and gives the hair a fluid soft sheen. Ouai Rose Hair and Body Oil (miniature shown from Morning After Kit here and here, full size here) is something I reviewed a few months ago. I still love this for both body and hair. I like this on damp hair or on ends to add a bit of shine with a nice scent. Maison Francis Kurkdjian Aqua Universalis Hair Mist ($65 for 70 ml) is a beautiful hair perfume. After all these years of hair mists I still haven’t tried many as I’d rather just spray perfume in my hair. This has completely changed my outlook. This one is light and soft and alcohol-free. It’s a soft floral with a bit of citrus and musk and mists the hair in a fine veil of scent. Lasting power is quite good on me – I was able to smell it even in late afternoon. In terms of styling tools, I still haven’t found a brush that I 100% love for function and looks. Right now I use a CHI Turbo Paddle Brush which I’ve had for years and is pretty worn down. If you have any ones you love let me know in the comments. For blow dryers my go-to’s are in this post and you can also see my hair type there as well. That wraps up my summer hair care loves! What are your current favorites right now? If you can share your hair type as well that would be super helpful 🙂 If you live in Florida or have traveled here for an extended time I’d love to hear what you’ve used or use while here! Press samples include the Shu Uemura BB Serum, Maison Francis Kurkdjian Hair Mist, Christophe Robin Volumizing Paste, Christophe Robin Leave-In Mist, Molton Brown Seabourn Collection.